Architectural photographs should be clean, simple, and graphic. They should tell a story clearly and without distraction. They should focus on the architecture--the shape, pattern, line, and design of the space. Any element that does not contribute to the story of the photograph detracts from it. That’s why I almost always remove unnecessary, non-architectural elements like light switches, outlets, and air vents from architectural images. These changes are a normal part of post-production and are relatively straightforward to accomplish. Sometimes, however, more difficult situations arise. I’d like to share two examples from one of my recent projects. 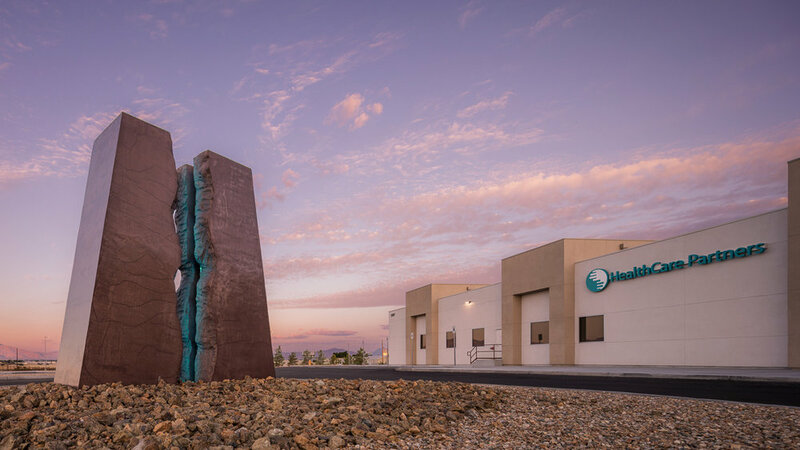 The new HealthCare Partners facility in Pahrump, NV features a rock sculpture with light display. Designed by Daniel Amster, Dakem & Associates, LLC. HealthCare Partners is opening a new 57,000 square foot medical center in Pahrump, NV. The building was designed by Daniel Amster of Dakem & Associates, LLC. The photograph above shows the exterior of the structure, which includes a large rock sculpture with a multi-colored light display. The photograph below shows an interior view of the main hallway of the building. Main hallway of HealthCare Partners in Pahrump, NV. Designed by Daniel Amster, Dakem & Associates, LLC. Look at the back wall on the right side of the photograph. That’s not how the wall looked when I was there. Here’s one of the raw images before post-production. There were several palettes with lots of large boxes up against the wall. Unfortunately it was impossible to move the boxes out of the way. I needed a photograph from this perspective, though, and I was able to fix this issue in post-production. Note the boxes against the wall on the right. I knew it would be possible to remove the boxes in post-production because they were sitting in front of a blank wall. That's easy enough to replace. The hard part about this fix was recreating the light and shadow on the wall. There is a diagonal shadow and an intersecting hot spot from an overhead light, and I had to reproduce the subtle changes in light and shadow accurately so the fix would be convincing. This fix was time consuming and required some Photoshop skills, but it was necessary and well worth it. The otherwise acceptable photograph would be unusable without this fix. HealthCare Partners main entry, Pahrump, NV. Designed by Daniel Amster, Dakem & Associates, LLC. Returning to the exterior, here's a view (above) of the main entry of the building. I made one major change to this photograph to prepare the final image. The column on the left has a heavy garbage can in front of it. It was too heavy to move any distance, and I did not have a dolly to get under it, so I had to photograph with it in the frame. It could not remain in the final image, however. Note the garbage can in front of the left column. The fix for this situation was more difficult because I actually had to reconstruct the column. I paid a lot of attention to matching the color and lighting of the column. If you didn’t know I had done anything there, I don’t think you would be able to tell that anything has changed, and that is always my goal with these kinds of fixes. Rescuing photographs from problems that could not be fixed on location is an important part of post-production in architectural photography. It’s not easy, and it is always much better to fix things on location when possible, but I love doing it. I’m always amazed at what can be done with Photoshop given enough time, experience, and attention to detail.